Claimed by the Elven Brothers: Decision and Fate Collection Now Available! You Asked For it and Now it's Here! 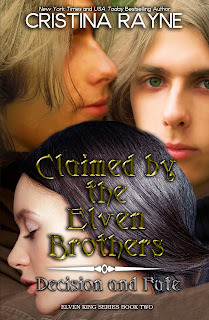 Claimed by the Elven Brothers: Decision and Fate Collection Now Available as an Amazon Exclusive! It started with a dream—a dream of two pine trees with a dead branch fallen between them along the jogging path she often frequented, but when Megan Reyes is driven to seek out the place in reality to rid herself of what was quickly becoming an obsession, instead of the big fat nothing she expects to find, she discovers more than she bargains for when she steps between the pines and is confronted by a very familiar pointy-eared man she last saw in her dreams. He and his brother have been waiting for her, and what they want will test how far she is willing to go to escape the dullness of her everyday life just for the chance to spice things up. *NOTE: Links will update as they become available in each eStore. Tempted by the - Lion? Now Available! Book 5 of my Riverford Shifters series is here! After a harrowing adventure in London, Kylie and family are finally able to meet up with the Alpha of her mother’s shifter clan. However, not only does the meeting have an outcome none of them expect, but promising news from Riverford about the potential whereabouts of Kylie’s mother has everyone rushing back stateside. Hunter’s brother, Ryder, along with several old and new allies are soon dispatched to investigate a genetics research company in Los Angeles where he meets Charlotte, a human geneticist for the LA lion clan that could very well be the key to not only learning the fate of Kylie’s parents but also learning the purpose of the lion clan’s secret Amarillo compound. Ryder just needs to sneak a woman he’s not sure they can trust out of the city with the whole LA lion clan snapping at their heels all while his jaguar soul is far too interested in mating her. Easy, right? Tempted by the - Lion? concludes Kylie's family's arc in this series. I will be releasing a bonus, follow-up novella called Suspecting the Lioness in the fall but then will soon begin a new series of standalone novels in this universe early next year. I'll post more on this at a later date. Until then, enjoy!